Fall brings with it the explosion of colors on the leaves of trees before they begin their slow descent to earth. Skies turn grey and the days grow shorter. Those first few breaths when you step out on a frosty fall day is a sign that old man winter is not to far away. For most people it is time to turn inward both physically and mentally. My yoga practice has always been something that gone in cycles. As a college student, I remember practicing poses awkwardly out by the Huron River and trying to make sure that no one saw me. When I met my wife, the local yoga studio was the place for a few of our dates, but I still fought the poses physically. I didn't take what I needed from them or focused on the breath. It wasn't until I found a new studio about 6 years ago before the birth of my daughter, that I really began to appreciate what yoga could do for me. A few classes a week, helped to quiet my racing mind and opened up the tightness in my hips and legs that I had from running. Through my time on the mat, it was probably the best physically overall I have felt. Not to tight and not to loose. It was a calmness that I carried from the mat and into my daily life. In the midst of that cycle, the yoga studio owner changed up practices and demanded more from me both time and fiscally then I was able to give with the birth of my new daughter. Sadly, I had to roll up my mat and retreated to my home practice that was nowhere as frequent or focused as at the studio. 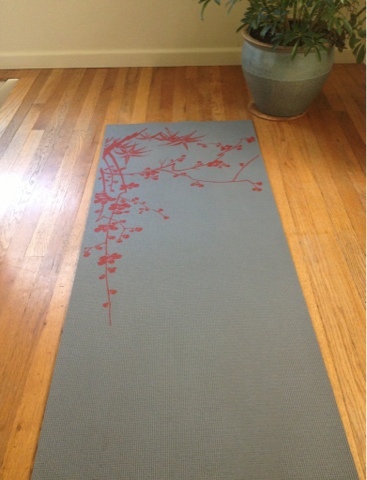 I reached out a few years ago to the owner again because I did really enjoy the practice and had heard that they had softened their views, but alas, it was the same as before and my yoga mat grew cold from the lack of use. Who knew that it would take a case of plantar fasciitis and a Groupon to get me back on the mat and into the studio? Since spring, I have dealt on and off with a case of plantar fasciitis and being somewhat of a bonehead, I have not given it my full attention to heal. I got the message loud and clear after pacing my friend last month at their 100 miler, that I need to not run races for the rest of the year and to focus on getting better. While I certainly had not been diligent in my yoga practice, a few downward dog and pigeon poses here and there were not enough to keep my body in balance. I began taking to the mat a bit more regularly and when my wife wife purchased a Groupon for the local yoga studio, I was a bit jealous. She began going quite regularly and I could see a difference in her posture and energy level. I wanted that to. Last weekend with no kids, we went on a yoga date. It was the first time to this new studio and when asked if I had practiced before and mentioned the previous studio there was a look of recognition like we understand because apparently lots of people have left for the same reasons I did. In this new studio and space, I felt at ease. There was no judging and the instructor kept repeating to be grateful and to feel the breath. Yoga is not about resistance. Yoga is about opening yourself and breathing into that tightness to release.